The wildfire, dubbed the Lockheed Fire, started Wednesday night. Feasting on junk pines, manzanita and overgrown, bone-dry foliage, egged on by Thursday’s hot, breezy weather, it grew quickly out of control. By Friday afternoon it had consumed 5000 acres of land and was only fifteen percent contained. 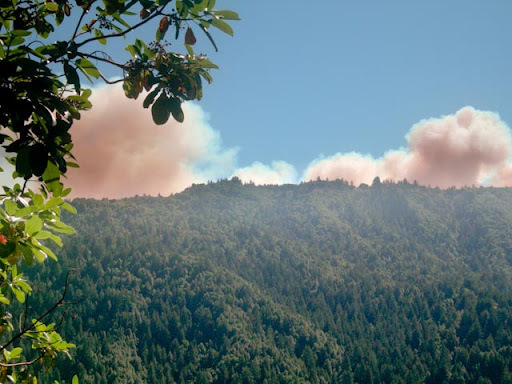 Although the fire is only ten miles from us, fortunately it is burning away from us, down the ridges and canyons toward the Pacific coastline. But it is still close. Too close for comfort. We have a beautiful home nestled in the Santa Cruz Mountains. Large picture windows afford us a redwood-studded view of the valley and surrounding ridges. Often I’ll look out my bedroom window as I’m practicing my violin, enjoying the beauty, the serenity. Thursday afternoon was not serene. We’ve lived in this house for twelve years, long enough to see some action. Last summer was “the summer of the fires” in my mind, with two big wildfires close by, and further down the coast, the Big Sur Fire, which devastated a region very dear to my heart. The latter raged on and on and even though I couldn’t see it, it felt like my soul was weeping, burning along with the trees. I’m so attached to the trees. But the truth is this: you make your home in the mountains, in a hot, sunny region that won’t get rain from May to October, you can expect wildfires, and some will be close. All that wood on fire. How it grieves me. This fire, however, is not “my” wildfire, not the way last year’s were. And that makes me feel both relieved and humbled, somewhat ashamed that I can go along with my daily routine while my neighbors across the ridge can’t. On Friday we don’t see the plumes of smoke. Either the wind has shifted or the fire has moved further down the ridges, closer to the ocean. Now it is coastal Santa Cruz that is feeling the effects of the fire. While running errands there earlier, my son and I observed the sky, overcast with smoke. 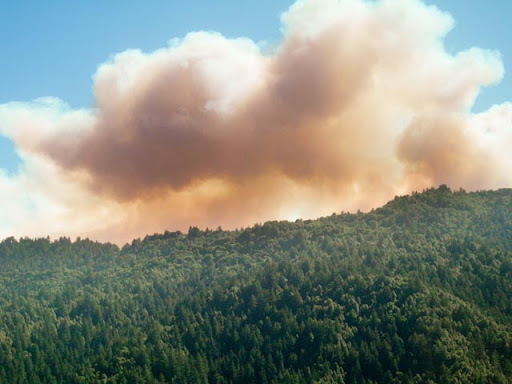 There was a yellowish tint to the air and an acrid, burnt wood smell that reminded you at every turn that a wildfire was burning out of control only ten miles away. Then we shrugged and went about our errands. Because that’s life for you. A tragedy can be close and feel far. It can be far and feel close. In most situations, however, you are only peripherally affected, and life goes on as usual. So, at the same time as always, I go to my practice room, pick up my fiddle, my bow, and begin to play. 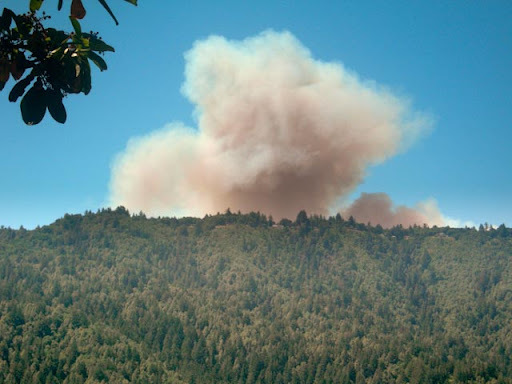 I pause from time to time to look out at the now-deceptive serenity, the sight and staccato thrum of helicopters overhead the only reminder that a fire rages on uncontained, ten miles away. I humbly offer a prayer to those affected; I silently thank the fates for sparing us this time, and then I make my wooden instrument sing. Glad to hear you guys are OK. We don't get a lot of fires around here (knock on wood) but when I'm cowering in the basement during a tornado storm, I don't practice!!! You are very brave! Tornado watches/warnings are in a class of their own. All those negatively (or is it positively?) charged ions bouncing off the ground and swirling around, mucking up everyone's moods. (Got plenty of that during my childhood in KS.) This feels just weirdly normal, outside the visual range. Oh, this is so AGGRAVATING trying to get the pictures to load each time. Laurie, what's up with this? Is it because I did three images and it prefers only one? Okay. Let me do it this way. Sorry to be such a nuisance, everyone! Terez, I'll have Robert look into the photos and let you know what's going on. We get the fires here, too, and after 10 years, I'm still not used to it. Fire is such a dramatic, destructive force; it seems almost unbelievable, how it can devour one side of a mountain and leave the other side completely intact. What you say about practicing/life goes on during major stressful events is interesting. I think the only time I couldn't practice was the couple of weeks after 9/11. I played some, mostly the Ciaconna, but practicing didn't happen, for obvious reasons. But yes, usually The Routine must continue. Okay, I see the pics now. That's good. Will hold breath. Laurie - I figured you'd be able to understand the threat of wildfires. It's a bigger problem in Southern CA than here, with those Santa Ana winds. My friend in Woodland Hills has had some serious scares. Well said. So close, but so far away! Terez, I believe that I've had an emotional response similar to yours but with different aspects of Nature. I used to own a small, humble cabin in the foothills of the Blue Ridge. It was my spirit place. I love the gently rolling green hills, woods, cool mountain streams, views of the mountains, clean air, the stars at night, the ol' swimming holes, all the flora and fauna and ecosystems, and the low population density. Several times in recent years that area has been devastated by floods. The ankle or knee deep streams became forceful torrents, knocking down forests, picking up boulders which moved man made structures such as roads and homes, making many people flee from their homes. I was not directly involved, but I felt sorry for those who were. I can not find words to describe my feelings as I witnessed a benign face of Nature turn to a destructive one. Pauline - once again, I feel like we speak the same language, feel the same thoughts. A humble thanks for that. And Michael, thanks for your comments, too! I'm curious if others can see the photo images. Only one, the third photo, has been showing up for me. Every now and then, two pop up. Once or twice, it's been all three images. The rest of the time it's been question marks. But, like, how existential is THAT? Fitting, one might say. Terez, glad you are out of the line of fire this time and sincerely hope you are in the future. When a person purchases a home in the woods, one thing for sure is that sooner or later the woods are going to burn and some day the home will burn. Maybe not in your lifetime but just a fact of life. Like everything your dad taught you or should have, don't ever buy a home on a cliff, they may slide, and in a draw or low spot, sooner or later it will flood, and forests burn. Fact of life and if you love the woods as most of us do you just have to accept that and hopefully prepare as best you can. Those southern california brush fires sure show what can happen almost every year, fortunately most homes in the woods last for hundreds of years but it only take one time and very sad. Don - thanks for your comments and thoughts. Very well put! We've had a few here in the Snowy Range in the past 10 years. Scarey stuff indeed!!!!!! Royce - I remember the summer my family and I went to Yellowstone (maybe 5-6 years ago) - the public radio station had regular updates on fires burning and containment level of each one, and I remember being so amazed that it was just like a weather report or something. All so matter-of-fact. It made me realize for the first time how common a wildfire could be, and not necessarily some terrible thing if it didn't involve housing or communities. Some land needs to be burnt out from time to time, I now understand. It's a bit of a paradox - the nutrients that come from a fire is good for the soil. And not all fires are reported on the national news. Amazingly, many burn out without consuming a whole mountain. If ever you walk the forests here you'll come across logs upon logs of dead wood. As high as your thigh and the ground beneath it hasn't seen the sun light in decades! In times past, when no one could put a forest fire out, our forests were richer. Pine beetles are decimating the forests here now, and I think that what will controle the beetle will be several massive fires. > If ever you walk the forests here you'll come across logs upon logs of dead wood. As high as your thigh and the ground beneath it hasn't seen the sun light in decades! That's amazing, and you're right, when the forest fires were more "naturally" controlled (as in, not -- but no housing, no communities in the way, either), nature did well for herself. Controlled burning is a tricky issue these days.